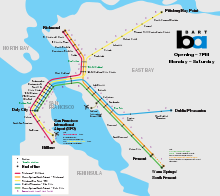 Bay Area Rapid Transit (BART) is a heavy rail public rapid transit system that serves the San Francisco Bay Area in northern California. It joins the cities of the East Bay, including Oakland, with San Francisco. Construction began in 1964 and the first trains began running in September 1972. Map of the lines on weekdays. The red and green lines do not run on weekends. As of 2018, there are five main lines on the system using electric multiple unit trains, two of which only run during weekdays. There is 112 miles (180 km) of track (using a wider-than-normal gauge of 1,676 mm (5 ft 6 in)) and 46 stations. Similar to other rapid transit systems in the world, tracks are in underground tunnels in inner cities, and on elevated viaducts in suburban areas. In some places, they are in the middle of freeways. The busiest part of the system is the Transbay Tube, a 3.6-mile (5.8 km) underwater tunnel under the San Francisco Bay. Almost 150,000 people pass through the tube every day. The fare which people pay to ride BART depends on how far they go. They first buy paper magnetic stripe cards inside the station. Then they insert this ticket into the gate, walk through the gate, and take the ticket out. They then get on board the train. Sometimes they have to change from one to another to get to where they want to go. After they leave the train at their destination, they insert their ticket into the fare gate again to exit the station. Printed numbers on the card show how much money is left on the ticket. A passenger who enters and exits the same station will be charged an "excursion fare". As of July 28, 2012, that fare was $5.25. In the 2000s, BART was expanded to reach San Francisco International Airport and now goes as far as Millbrae. Two other branch lines have opened since then. In 2014, BART opened a short line to Oakland International Airport that uses trains pulled by cables. An extension of the Pittsburg line to Antioch, which opened in 2018, uses diesel multiple units on standard gauge tracks instead of the electric, broad-gauge trains used on the main lines. A project is also going on to expand the southern main line into San Jose. The entire extension was supposed to be completed in 2018, but the first new stations are now expected to open in 2019. ↑ Disbrow, Bill (2017-03-25). "Here's what BART looked like on the original 1972 opening day". SFGate. Retrieved 2018-06-20. ↑ "Bay Area Rapid Transit Fast Facts". CNN Library. CNN. 2017-06-26. Retrieved 2018-06-20. ↑ Cabanatuan, Michael (2004-04-17). "BART warns of possible leaks in Transbay Tube in big quake". SFGate. Retrieved 2018-06-20. ↑ BART fare calculator. Retrieved July 28, 2012. ↑ Baldassari, Erin (2018-03-02). "Milpitas, Berryessa BART stations may not open until 2019". The Mercury News. Retrieved 2018-06-20.